A stork in the medieval town of Rust in the Burgenland. This most Eastern province of Austria used to be under Hungarian administration during the days of the Empire. Today, much of the culture in this region still shows the Hungarian legacy. This does not necessarily include storks, but the chimneys on which they nest: The houses of Rust and many other Burgenland towns were built in so-called "Anger style" with one house attached to another, so that the entire village would form a court around its main street. Every house had a chimney, now so popular with feathered visitors. 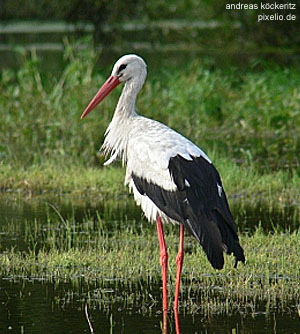 The Burgenland′s National Park Neusiedler See is a birdwatcher′s paradise beyond storks: it hosts approximately 320 species of birds over the course of a year.